The end of the world seems to be all the rage these days. Everywhere you turn, some nonsense theory pops up. If it's not the Mayan calendar proclaiming Armageddon, it's cries of the Antichrist finally coming in the form of Barack Obama. Both have zero validity, but that doesn't stop Hollywood from capitalizing on them (though we're still yet to see that Obama movie). In recent years, post-apocalyptic movies have flooded our screens. Just in the last few months we've seen director Roland Emmerich blow stuff up real good in 2012, the Oscar worthy picture The Road, and the vampire and zombie apocalypses in Daybreakers and Zombieland. Chalk another one onto the ever growing list with The Book of Eli, a moderately entertaining film that will appeal to the following interests. If you want to see three decapitations in about that same amount of time, you'll like The Book of Eli. 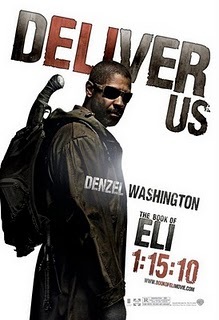 If you want to see a guy get an arrow through his crotch, you'll like The Book of Eli. However, if you want to see a post-apocalyptic tale with heart and meaning, you may want to look elsewhere. It's basically The Road meets Mad Max, but it's only about half as good as either of those films. The movie opens with Eli (Denzel Washington) as he embarks on a trip to the west (as opposed to the trip down south the characters take in The Road—totally different). The world has been destroyed by a war and something they call "the flash," assumably referring to a nuclear war, which blinded many of the remaining survivors. It's been thirty years and a new generation has now grown up not knowing about the times before where, as Eli puts it, "people threw away what they kill each other for now." On his trip, Eli stumbles into a broken down town where he is violently confronted. He asks for no trouble, but is forced to kill a whole bar full of people. Carnegie (Gary Oldman) takes notice. He's the leader of the town and has a slew of henchmen he uses to track down an old book, one he claims will be able to control the lives of those he reads it to, thus giving him power. Little does he know Eli has that book. What transpires is nothing more than a battle between the two factions for possession of the book. But what is the book? Well, if you have half a brain, you should be able to figure it out fairly quickly, though some still deem a reveal a spoiler, so I suppose I should offer up a warning. I will discuss what the book is and how this affects the overall picture, so if you want to go into the movie in the dark, stop reading. Now, with that out of the way, the book is the Bible. Again, that shouldn't be too hard to figure out. A quick glance at the poster should be enough to give it away. "Deliver us" isn't exactly the most subtle of taglines (nor is the more succinct Gary Oldman one-sheet, "Religion is Power"). Then again, there's also a giant freaking cross on the cover of the book, which you see very early on in the movie. But why did I feel the need to bring this up? Because it is necessary to discuss the message, one that is admittedly fresh in a business that seems to continuously be at odds with it. The recent comedy, The Invention of Lying, made it a point to deem religion a falsity. In fact, that was the whole basis of the film. The documentary, Religulous, does exactly the same (given the snarky title). But The Book of Eli is decidedly different. Its message here, without giving away the ending, is that there most certainly is a God and he (excuse me, He) uses people for a greater purpose. There's no doubt about it. He exists and works in all of our lives in ways we cannot possibly imagine. It's refreshing regardless of your religious beliefs. Unfortunately, I've always been one to lean on the side of thought and interpretation rather than the straight forwardness of The Book of Eli. The Invention of Lying may have been anti-religion, but it posed questions. Would the world be better without it? Would there be war? Would it even exist in a world where nobody could lie? The argument it makes is that religion is merely a temporary solution to life's problems and that speculation about the afterlife is time wasted when we could be doing so many other positive things right now. Religulous, in it's own sarcastic way, does the same. These films make us question our beliefs and the beliefs of those around us, which is fascinating. The Book of Eli doesn't. Sadder still is that it sets itself up to do just that, but never does. As noted before, Carnegie is searching for the book, knowing full well that it is the only Bible left in existence. He wants to use it to control people, insinuating its power and how it can be, and most certainly is, used for evil. At one point, Eli mentions that some people even think that it was the cause of the war that destroyed their planet. Well, religion is used to justify wars. Why not explore those themes? Regardless of its missed opportunities, it was nice to see a pro-religion film. It just would have been nicer for it to pose questions rather than state facts, something too many religious people do already. But there's more to this thing than just its religious message and, unfortunately, not much of it is particularly impressive. It may be supporting Christianity, but boy does it get bloody. This is an action movie after all. Though the action is stylish and fun, it usually comes about arbitrarily. One scene that ends with multiple bodies strewn across the floor is initiated by Eli shoo-ing a cat away from his things. The cat's owner is none too happy and attacks Eli. Too many action scenes felt randomly placed in the movie rather than working out of necessity of the story. The Book of Eli is a moderately successful, sporadically entertaining post-apocalyptic film that borrows from other, better movies ranging from a shot taken directly from The Road to a scene that mimicked The Devil's Rejects. Outside of the admittedly clever twist, which nevertheless is never completely satisfactory, The Book of Eli doesn't offer much other than an unexplored message stated matter-of-factly. This might work for some, but for those who like to think about religion and discuss it rather than have it shoved down their throats, The Book of Eli is a bust.